The leading independent specialist for windscreen replacement and windscreen repair based in Cardiff and serving all of the Cardiff area. National Windscreens Cardiff fitting centre provides windscreen replacement and windscreen repair services to businesses and individuals throughout Cardiff and the Cardiff area. 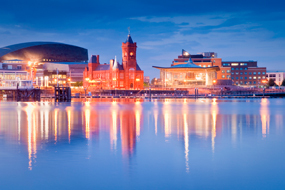 Cardiff is the capital city of Wales and is host to a number of sporting and cultural venues. The Millennium stadium is home to the Welsh national Rugby and Football team. It is also Wales’s largest city, situated on the M4 there is ease of access to Newport, Bristol and London to the east and Bridgend and Swansea to the west. The new waterfront development in the area of Cardiff Bay contains the Senedd building which is home to the Welsh Assembly and the Wales Millennium Centre arts complex. The Cardiff windscreen fitting centre and its mobile vehicle glass technicians service the needs of Cardiff and the surrounding area including Barry, Caerphilly, Pontypridd and Merthyr Tydfil. With 108 fitting centres and over 800 mobile technicians, National Windscreens operates the UK's largest windscreen repair and windscreen replacement network. The company provides low cost, high quality windscreen replacement and windscreen repair from its Cardiff fitting centre 24 hours a day, 7 days a week, 365 days a year. Repair and replacement of all types of vehicle glass including windscreens, rear windows and side windows is undertaken throughout Cardiff and all of the Cardiff area.